A conjugate base is what is left after an acid has donated a proton. 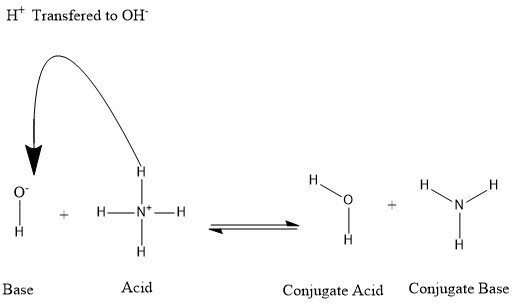 Conjugates are formed when an acid loses a hydrogen proton or a base gains a hydrogen proton. * ammonia acts as a base because it can combine with a hydrogen ion. It’s partner ammonium is now an acid, for it has a hydrogen ion that it can give up; once it does it is converted back into ammonia. * water acts as an acid because it gives away a hydrogen ion to ammonia. Once it has lost the hydrogen ion and becomes hydroxide, the hydroxide in turn can act as a base and accept a hydrogen ion from ammonium. Conjugate acid-base pairs differ from each other by the presence or absence of a single hydrogen ion (proton). Every acid has a conjugate base, and every base has a conjugate acid. The conjugates will always be listed on the product side of the reaction. 1.1 What are acids and bases?